Dragon-like race, can breathe fire. Descended from the Elder God Aslarn, the aslarans are a race of feline-like humanoids. They have an affinity to open plains and are excellent hunters. Some males grow great manes. The colour of their fur ranges from light beige to more tawny browns. Several branches of aslaran are known to sport stripes or spots. Their natural speed make them excel in any physical profession. Level 1: Health regeneration when in all natural outdoor areas. Level 25: Resistance to cold damage. Level 50: Increased movement speed in all areas. Demigod: Ability: Pursuit - The player focuses on a single target, should they leave the room the player will follow, pouncing after the target and knocking them down as a free action. Does not work against tumble, flight or magical travel. Once fired, this ability cannot be reused for five seconds. Demigod+: Improved Ability: Pursuit now stuns the target for 2 seconds. Descended from the Elder God Dracnoris (also known as the Dragon God), the dracnari are a race of lizard-like humanoids with the ability to breathe fire. They have an affinity to volcanic regions, especially the fire hills of the southwest, where they were the primary founders of the city of Gaudiguch (which became lost in time during the Taint Wars). Their skin is scaled green and features range from the truly draconic to remarkably human-like. Like the merians, dracnari do not recognize half-breeds: either you are a dracnari or are not, denoted by the ability to breathe fire. Level 1: Resistance to psychic damage. Ability: BREATHE FIRE. Melts an icewall in any direction (example: BREATHE FIRE ICEWALL AT EAST) or burn briar/thorn walls. Can light pipes with their breath (LIGHT PIPE). Level 25: Resistance to fire damage. Level 50: Health and mana regeneration when in burning environments. Dracnari with the Pyromancy or Pyrochemantics specialisation gain a bonus to fire and asphyxiation damage. Dracnari with the Paradigmatics specialisation gain a bonus to fire and psychic damage. Dracnari with the Minstrelry specialisation gain a bonus to both fire and psychic damage. Demigod: Trait: Breath of Dracnoris - BREATHE FIRE now ignites briar and thorn walls as well as melting icewalls on a faster balance. It automatically lights smoking pipes passively. The dracnari also has a 5% chance to breathe fire on attacks against other players, dealing fire damage and afflicting the target with ablaze. Demigod+: Improved Trait: Breathe fire can now affect adjacent rooms (eg BREATHE FIRE ROOM AT WEST) causing fire damage to all within and causing a chance to set the room ablaze. Also has a 10% chance to trigger on all attacks against denizens (Attacks against other players remains at 5%). Dracnari trained in the arts of Pyromancy, Pyrochemantics, or Transmology. Dracnari warriors trained in the arts of Paradigmatics. Dracnari trained in the arts of Minstrelry. Descended from the Elder God Clangorum, the dwarven race originally called themselves the clangoru, but humans, when they first arrived in Lusternia, for some reason insisted on referring to the clangoru as dwarves, a term which eventually became accepted in the common vernacular. Although they look like humans, they are substantively shorter and stockier, and their hair grows at a rate five times faster than that of humans. Thus, most male dwarves prefer to grow beards rather than shaving five times a day. Contrary to rumour, it is rare for a female dwarf to grow a full beard; however, growing long, silky sideburns which can be braided is a fairly common practice. 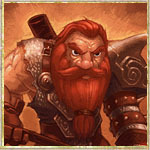 They are a robust mountain race with a rich history, though the dwarven kingdom itself was split during the Taint Wars. Level 1: Resistance to fire and cold damage. Level 25: Resistance to blunt and cutting damage. Level 50: Dwarves gain natural resistance (not immunity) against elemental movement effects. 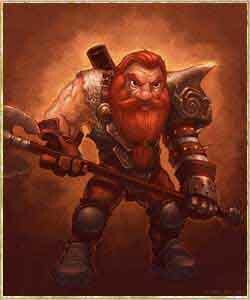 Dwarves with the Axelord specialisation can use two-handed axes more effectively than any other race. 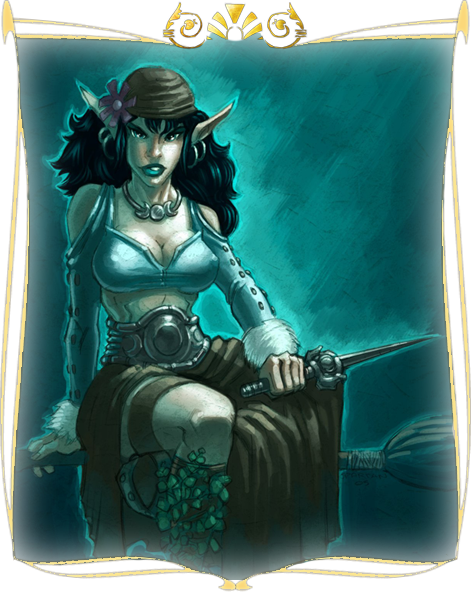 Dwarves with the Music skill gain the trait sociable drinker, increasing their empower and seduction ego attacks while influencing. 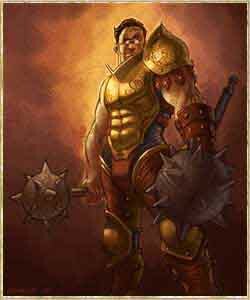 Demigod: Trait: Guts of Steel - Dwarves can consume more alcohol before suffering the effects of inebriation, their racial resistances increase depending on the Dwarf's inebriation levels. Demigod+: Improved Trait: Raging Alcoholic - Dwarves gain a bonus to all damage types, scaling with the Dwarf's inebriation. Dwarves of the bardic path who also study the Alchemy specialization of Brewmeister. A cross between an elfen and a fae creature. 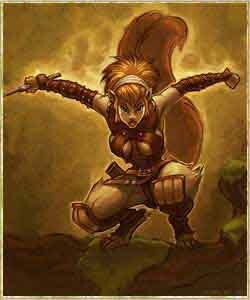 Descended from the Elder Goddess Elfenehoala, the elfen race have always had a close affinity to the forests. They consider themselves the saviours of Lusternia as they were who first discovered the ailing Fae, spirits of nature, and healed them and likewise the forests. They are a lithe, beautiful people, with delicate pointed ears and almond-shaped eyes. Their skin tone ranges from alabaster white to some varying hues of green. Though most Elfen still prefer forest communes, there are those who have been drawn to city life. Level 1: Resistance to magic damage. Level 25: Resistance to psychic damage. Level 50: Health and mana regeneration when in forest environments. Elfen with the Stag specialisation gain a bonus to both magic and lightning damage. Elfen with the Moon specialisation gain a bonus to both magic and divinus damage. Elfen with the Wildarrane specialisation gain a bonus to both cold and divinus damage. Demigod+: One With Nature now grants a bonus to both all damage types and damage resistances in all natural/forest environments. Elfen wiccans and druids that specialize in the Moon or Stag totem. Elfen warriors that specialize in either the Moon or Stag totem. Elfen bards that learn the art of the Wildarrane. Faelings are not descended from an Elder God. Rather, they are the cross between an elfen and a creature of the fae. 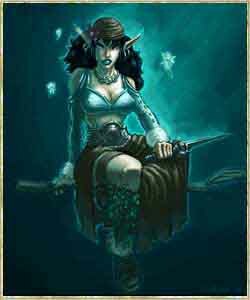 Faelings are almost always raised in elfen communes, and are given special status by wiccans. 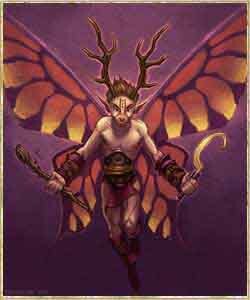 Physically, they look like extremely diminutive elfen, even smaller than the furrikin, and they all have elaborate butterfly-like wings enabling them to fly. While not very strong, they make up for that in speed and intellect. Ever since the undead elfen Rowena Nightshade tricked Laeroc, Consort of the Queen of the Fae into fathering her child, faelings who take the path of the wyrden Great Nature Spirits of Night or Crow transform into shadow faelings, a curious breed of faeling, larger than others of their kind, with a dark complexion that seems to churn with shadows, more bat-like wings, and eyes that glow with a somber red fire. Note: Not all faelings have antlers. 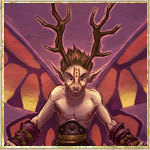 The antlers on the faeling in the picture is the result of the Stag Totem specialization. Level 1: Resistance to divinus damage. Level 25: Ability to FLY. Those who can fly by other means are no longer knocked out of the sky by winds, and are instead stunned for two seconds. Level 50: Health and mana regen in forest environments. Faeling with the Crow specialisation gain a bonus to both magic and poison damage. Faeling with the Night specialisation gain a bonus to both asphyxiation and excorable damage. Faeling with the Shadowbeat specialisation gain a bonus to both poison and excorable damage. Demigod: Trait: One With Nature - Health/Mana/Ego regen in all natural environements. Demigod+: One With Nature now grants a bonus to all damage types and damage resitance in all natural/forest environments. Faeling wiccans and druids that specialise in the Night or Crow totem. Faeling warriors that specialise in either the Night or Crow totem. Faeling bards that specialise in the art of the Shadowbeat. The Elder God Bollikin was the first Elder God to fragment his being, popularly believed because his gentle nature could not abide the impending Elder Wars. As the first Elder God to splinter, Bollikin did not achieve the uniformity of race reflected by other races. Legend has it that Bollikin was so endeared to all the smaller creatures that he could not concentrate on a chosen form at the time of fragmentation. 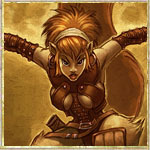 Subsequently, the furrikin race have an unusually wide range of forms, some bearing a striking resemblance to rabbits or foxes or dogs or even small bears (looking like miniature tae'dae). Whatever their form, furrikins are generally quite diminutive and nimble. Furrikin are considered a passive race, though they have been known to bristle their hair when being derogatively referred to as "furrballs". Level 1: Resistance to cold damage. Level 25: Resistance to magic damage. Level 50: Increased seduction and charity attacks while influencing. Demigod: Trait: "Slippery little..." - Writhe and tumble replaced with SLIP and ROLL. Demigod+: Furrikin can now roll up to two rooms in any one direction. The most adaptive of the Lusternian races. Largest of all races, extremely hairy. The human race is the only race not native to Lusternia and arrived with the coming of Estarra. They proved to be a most fertile people, able to interbreed with the other races. Because of this, humans range in all shapes, sizes and colours. Humans are the only race who make distinctions between themselves based upon appearance, dividing themselves as "old humans" meaning those with the original skin colour of their race (though ranging from lily white to chocolate brown) to "half breeds" who have skin tones of the native Lusternian races (such as the blue skin of the merians or green skin of the dracnari or even the bright red skin of the viscanti). Level 1: Increased experience and essence gain. Level 25: Health regen in urban areas. Level 50: Equilibrium reduction on FIRSTAID and DIAGNOSE. Humans with the Healing skill gain health regen instead. 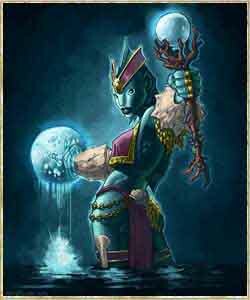 Demigod: Jack of All Trades - Reduces essence loss on death as well as an increase to gains of karma and esteem. Demigod+: Master of None - Grants a bonus to all forms of damage reduction and damage increase bonuses. 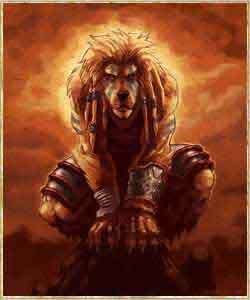 Descended from the Elder Goddess Igaso, the igasho are by far the largest of the mortal races. They tend to be solitary wanderers, though their personality is generally jovial and good-natured. Their thick fur and hide allows them protection against the harshest of weather, and igasho native to arctic regions have long, white fur. Most igasho prefer forests and open ranges rather than prolonged confinement in cities. Slow to anger, when roused, an igasho makes a ferocious fighter as they are extremely strong and hardy. Level 25: Igasho gain the ability to SCALE naturally. If they have learned SCALE in the environment skillset, they now do so at half the balance cost. Level 50: Igasho gain a natural bonus to their warmth stat. Igasho with the Blademaster specialisation can use one handed swords more effectively than any other race. Demigod: Ability: CARRY - Using their sheer size and strength, an igasho will unceremoniously pick up their target and walk out of the room with them. This ability cannot be used more than once every 10 seconds. Demigod+: Improved Ability: The Unstoppable Force - CARRY now ignores the target's movement resistance, and will smash any walls impeding progress with brute strength. Anyone blocking in the same direction you move will be knocked prone. Additionally, for 10 power an igasho can break past powerful barriers like a great pentagram. 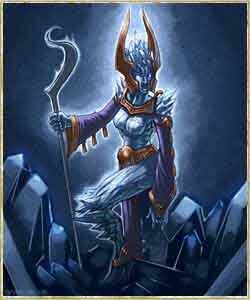 Descended from the Soulless Goddess Illith, the illithoid are a race with a distinctly unique appearance, pale skin that ranges from grey to purple. They are the only known race to have splintered from a Soulless God, and are thus considered abominations by many races, especially the kephera who kept their progenitor Illith imprisoned until she splintered into the illithoid race. The most notable feature of illithoid is their possession of what they call the "inner worm", a creature that resides within every illithoid's body that feeds on psychic energies. Language: Common, Can understand all spoken language psychically. Level 1: Resistance to psychic and poison damage. Level 25: Resistance to excorable damage. Level 50: Health regen while underground. Illithoid with the Ninjakari or Nekotai specialisations can use chains and nekai more effectively than any other race. Demigod: Trait: Inner Worm. Allows illithoid to ILLDRAIN corpses. Every five corpses grants a bonus to ego stacking up to 5/10. 1 hour duration. Demigod+: Improved Trait: Illdrain now stacks to 10/10. While at maximum, the Illithoid empowers their psionic capabilities, granting them insight into the thoughts, feelings, and emotional state of others. Increased empowering, seduction, paranoia, charity and weakening ego attacks while influencing. Dark Reaper: If Cthoglogg has been empowered, all ego costs for abilities are reduced by 33%. Note: This does not work against things that cause ego damage such as debating and Telekinesis' FORCEFIELD. Very matriarchal and psionic insectoids. 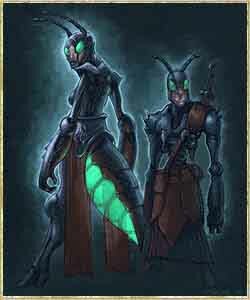 Descended from the Elder Goddess Keph of the Thousand Eyes, the kephera race present themselves as insectoid humanoids. Along with the illithoid, they are the newest race to have been discovered in Lusternia. Before, they were hidden beneath the Basin of Life and their sole purpose was devoted to containing the half of Illith that was severed in two by Keph. When this half of Illith splintered into the race of illithoid, the kephera had no choice but to make themselves known to the rest of the Basin. They are matriarchal in nature, and are the only race whose females and males have remarkably different statistics. Another unique attribute of a kephera is their strong exoskeleton, which acts as a natural armour. Level 1: Resistance to cutting and blunt damage. Level 50: Health and ego regen while underground. 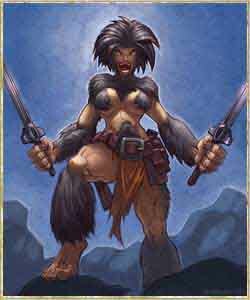 Kephera with the Shofangi or Tahtetso specialisations can use shofa and tahto more effectively than any other race. Demigod: Trait: Chitinous Hide - grants the kephera armour equivalent to splendours. Kephera specialised in tattoos can further enhance this armour to be equivalent to full tattoo armour. This bonus is lost should the kephera wear any other armour. Demigod+: Improved Trait: The kephera channels a psychic barrier through their hide, offering further protection against certain attacks. Male kephera reduce all damage taken from asphyxiation, blunt, cold, cutting, fiery and poisonous attacks by 1/3 and instead take it as ego damage. Female kephera reduce all damage taken from asphyxiation, cold, divinus, electrical, excorable, fiery, magical, poisonous, and psychic sources by 1/4 and instead take it as ego damage. Royal Kephera: If Zenobia has been empowered, female kephera may form their own hive as Hive Queen. All other kephera, male and female, may join this hive. Hives have their own dedicated channel, and all members gain icnreased experience, karma, and esteem. Hive bonuses effect kephera regardless of location or proximity to other hive members. Hives persist through logout and will only be dissolved should the Hive Queen choose to do so, or if Zenobia is slain. Descended from the Elder God Krokano, the krokani are very large, one-eyed giants. Despite their enormous size (indeed, their height is second only to igasho), they can be surprisingly dexterous. Unfortunately, they are not an extremely intelligent race and have been known to be unwittingly used by others as shock troops or first line defense in war time. 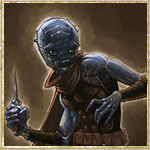 Added to the fact that they are not a very fertile race, the krokani are becoming rarer and rarer to find in Lusternia. Level 1: Resistance to blunt damage. Level 25: Resistance to magical damage. Level 50: Equilibrium costs for GLANCE and OBSERVE removed. Krokani with the Bonecrusher specialisation can now use one handed weapons more effectively than any other race. Demigod: Trait: Enhanced Vision - Reduced effect of blackout on krokani, while doubling the length of immunity. Demigod+: Improved Trait: Sight Beyond Seeing - Can perceive the world even while blinded. Krokani also have the ability to spot pits while entering or exiting a room, giving them a chance to step around and avoid them completely. Descended from the Elder Goddess Loboshi, the loboshigaru are a race of humanoid canines (though some dispute whether they are more similar to wolves, dogs, jackals or all of them depending on ancestral tribe). They have amazing regenerative power, though they are susceptible to magical damage. Loboshigaru retain a "pack" mentality in that they prefer to identify with clans and groups and are known to be fiercely loyal to those groups. Most loboshigaru cannot help but see those outside of their groups as some sort of threat, or at least highly suspicious individuals who should be met with caution. However much of a social race they are, it is noteworthy that if an individual loboshigaru leaves his or her "pack" for whatever reason, they often remain intensely individualistic "lone wolves", sometimes leading an almost monastic lifestyle for the rest of their lives. Level 50: Famed for their loyalty and dependable nature, the denizens of the First World come to trust the loboshigaru at their word, whether or not the individual is of honest character is another matter. Increased empowering and paranoia ego attacks while influencing. 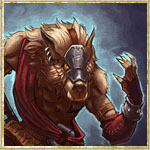 Demigod: Trait: Enhanced Regeneration - Loboshigaru gain 5/10 health regeneration, and 3/9 mana and ego regeneration. Demigod+: Enhanced Regeneration grants a 10% increase to all health healing spells and effects. Crystal people of logic and intellect. A very noble, waterbreathing race. Amphibious race with keen intellect. Descended from the Elder God Xyl, the lucidians are humanoids of living crystal. Their innate magical makeup make them resistant to magical attacks, though their crystalline structure makes them quite vulnerable to blunt attacks. This unique physique also regenerates while under the open sun. They tend to the more arcane and scholarly professions. They are generally more logical than emotional, and traditionally their philosophers and mages have tried to discern the patterns of the universe in order to understand the greater harmony of existence. This natural affinity to cold logic was a founding principle of the city of Hallifax (which became lost in time during the Taint Wars). The lucidians and the trills were the primary builders of Hallifax, which was a city in the clouds, an architectural wonder of crystal spires and aeromantic engineering. Level 50: Health and mana regeneration in cloudy environments. Lucidian with the Aeonics specialisation gain a bonus to excorable and magical damage. Lucidian with the Aeromancy or Aerochemantics specialisation gain a bonus to asphyxiation and lightning damage. Lucidian with the Loralaria specialisation gain a bonus to cold and asphyxiation damage. Demigod+: Improved Trait: Overcharged - Daytime power reserves increase to 2% per hour. Active power regeneration rate increased. Lucidian trained in the skills of Aeromancy, Aerochemantics, or Harmonics. Lucidian warriors trained in the skill of Aeonics. Lucidian who have trained in the arts of Loralaria. Descended from the Elder God Meridian, the merians are the proudest of the races and have the richest history. It was the merian Gorob who discovered the secrets of becoming a Vernal God and indeed became the first Vernal God. It was the merians who were the first to uncover the outer planes, and subsequently founded the Celestine Empire. Though merians can point to many great and notable achievements of their race, it must also be pointed out that the last emperor of the Celestine Empire, Emperor Ladantine VII, was a merian and responsible for the Taint. Merians are primarily ocean dwellers and the original race were decidedly aquatic looking. However, with the influx of humans and given their ability to interbreed with other races, many present day merians look astonishingly human-like, some even growing hair. Even so, all merians have bluish complexions (though ranging in hue) and the ability to breathe water. Despite interbreeding with humans, merians do not recognize half-breeds: either you are merian or are not, denoted by the ability to breathe water. Level 1: Resistance to cold damage and the ability to breathe underwater. Level 25: Merians can DIVE. Merians who already can dive from another skillset gain reduced balance time on SWIM while underwater. Level 50: Health and mana regen in flooded environments. Merians with the Sacraments specialisation gain a bonus to divinus and electrical damage. 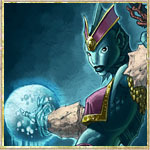 Merians with the Aquamancy or Aquachemantics specialisations gain a bonus to cold and asphyxiations damage. Merians with the Starhymn specialisation gain a bonus to divinus and fire damage. 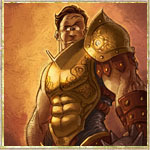 Demigod: Trait: Natural Born Leader - Merians who lead their own squads give all members a resistance to all damage types. The merian must be in the same room as their squad members for this to take effect. Demigod+: Improved Trait - Natural Born Leader also grants a bonus to all damage types dealt. Merian trained in the skills of Aquamancy, Aquachemantics, or Celestialism. Merian warriors who specialise in Sacraments. Merian who take up the art of Starhymn. Descended from the Elder Goddess Mugowumpois, this amphibian race originally favored the swamps and marshlands. However, given their great intellect, it was only natural that they gravitated to civilized areas in the pursuit of the more scholarly professions. The facial features of the mugwumps favor their amphibian heritage, giving them a frog-like or salamander-like appearance. However, with the interbreeding of humans, some mugwumps have a surprisingly human-like appearance. Level 25: Mugwumps can LEAP and breathe underwater naturally. Mugwumps who have leap from another skillset reduce balance recovery while leaping. Level 50: Such is the greatness of the mind of a mugwump, anything they suggest has to be a great idea! Increased empowering and charity ego attacks while influencing. 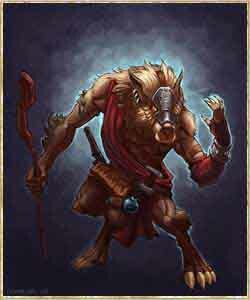 Demigod: Trait: Mental Superiority - All mana costs for spells and abilities cast by a mugwump are reduced in half. This does not affect abilities which give a direct mana to alternative resource such as transmute. Demigod+: Mental Superiority now reduces the amount mana drains affect the mugwump by 25%. Warrior race, large and strong. Bear-like race, extremely charismatic and strong. Bull-like race, dangerous in herds. 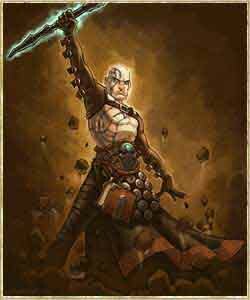 Descended from the Elder God Orlachmar, the orclach are one of the largest and strongest of the races. Their thick, mottled skin (generally a slate gray colour, though some tend to exhibit green tinges) provide excellent protection from physical abuse and their innate healing powers are legendary. They are a warrior race who maintained a strict military caste known as the ur’Guard. During the time of the Holy Celestine Empire, the ur’Guard were the main peacekeeping forces of the Empire, though after the Taint, they relocated to Magnagora to follow their death cult origins (though the modern day ur’Guard is open to any race). Many orclach who were caught in the Taint were twisted and broken into the sub-race of orcs, who are pale imitations to the true orclach. Because of this, there is a rift between those orclach who feel betrayed by the Taint and those who embrace it. Level 1: Resistance to blunt and cutting damage. Level 25: Resistance to magic and cold damage. Level 50: All corpse offerings increase in value by 5%. 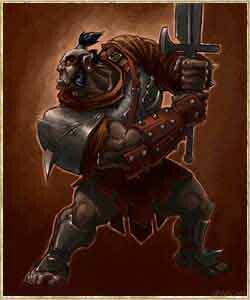 Orclach with the Pureblade specialisation can use two handed swords more effectively than any other race. Demigod: Trait: Embrace Death - When an orclach falls below 90% HP they gain resistance to all damage types. This is increased by one level for every 20% missing. Demigod+: Trait: Fain's Gift - On slaying a player or denizen, the orclach will drain part of their seeping essence, rejuvanating the orclach's health, mana, and ego. 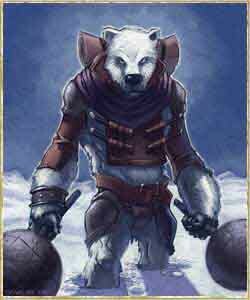 Descended from the Elder God Tae, the tae'dae are bear-like humanoids. They are an extremely large people, though their size is more in their breadth rather than their height, which likewise makes them as slow as they are powerful. Indeed, they are the innately strongest of all the mortal races. They seem to have no natural affinity to any specific environment, being found in arctic regions (the white furred tae'dae, often with blue tongues) to more temperate zones (brown or black fur) to some jungle regions (where their fur is curiously patterned in black and white). They are extremely affable, proud and charismatic, and most have an inborn desire to protect the furrikin, who are often inexplicably referred to as their "little brothers and little sisters" (and it is true some furrikin look like miniature tae'dae). Though notoriously known for being of small intellect, the typical tae'dae believes just the opposite, considering him or herself to be uncommonly wise. Level 25: Resistance to poison and cold damage. Level 50: Ego regeneration. Tae'dae with the Cavalier specialisation can use polearms more effectively than any other race. Tae'dae with the music skill gain the trait Everybody's Friend, increasing their empower and charity ego attacks while influencing. Demigod: Ability: BEARHUG - Causes a large amount of blunt and asphyxiation damage to the target. 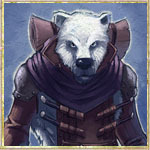 Demigod+: Improved Ability - BEARHUG can now be used on NPCs. If used on a player under 15% health it slays the player outright. 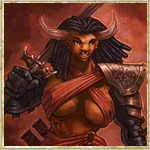 Descended from the Elder Goddess Tauro, the taurians are probably the most naturally aggressive of all the mortal races. They have giant, well-muscled bodies with enormous bull heads. While they make superb fighters, most military leaders are loathe to rely on taurians in large numbers because of their volatile and tempestuous anger, which sometimes erupts for almost insignificant reasons. Added to that, when taurians are in a group of their own kind, the anger of one can set the rest off and a "stampede" of battle-frenzied taurians have been known to decimate their own allies. As a result, taurians are discouraged from forming groups in multi-racial civilizations and, therefore, tend to find employment as individual mercenaries. Level 1: Resistance to cutting damage. Level 25: Resistance to electrical damage. Demigod: Ability: ENRAGE - a toggled ability (ENRAGE ON/OFF), when activated the taurian has a 10% chance per attack to lash out a second time, delivering a SWING attack to a random body party with their weapon or PUNCH if they have no suitable weapon wielded. This has a 50% chance of hitting the same target, and a 50% chance of hitting anyone else in the room. If the taurian is wielding a shield and has SHIELDSTUN in combat, they will use that rather than SWING or PUNCH. Demigod+: Improved Ability: Channeled Aggression - Chance for enrage's second attack to hit the intended target increase to 75% with a 25% chance of hitting anyone else on the taurian's ENEMY list if present, or anyone else if no enemies are in the same room. Has a 15% chance when attacking NPCs to SWING or PUNCH a second time. Feathered, bird-like race that can fly. Descended from the Elder Goddess Trillillial, the trill are a race of bird-like humanoids. They are very graceful and quite tall (though their hollow bones make them rather delicate). They have beautiful feathered wings, giving them the ability to fly, and the feathers of which range from a soft silver to more robust browns. No trill grows hair on their head, rather they have a cap of downy feathers. Trills prefer high mountain ranges where their forebears built great nests. The lucidian and the trills were the primary builders of Hallifax (which was lost in time during the Taint Wars), which was a city in the clouds, an architectural wonder of crystal spires and aeromantic engineering. Level 1: Resistance to cold and electrical damage. Level 25: Trill gain the ability to FLY naturally. Trill who can already fly by other means are no longer knocked out of the sky by high winds, but instead are stunned for two seconds. Trill with the Aeonics specialisation gain a bonus to divinus and magical damage. Trill with the Aeromancy or Aerochemantics specialisations gain a bonus to asphyxiation and lightning damage. Trill with the Loralaria specialisation gain a bonus to cold and asphyxiation damage. Demigod: Ability: EJECT - After a small charge up, sends the trill in a random direction up to three rooms away with a one second balance recovery on landing. Cannot be used indoors or underground. Demigod+: Improved Ability - Ejection now travels up to five rooms, and has no balance cost upon landing. Trill who learn the skills of either Aeromancy or Aerochemantics. Trill warriors who take on the Aeonics specialisation. Trill who learn the art of Loralaria. The viscanti are unlike most of the other races because they did not originate from the fragmentation of an Elder God. Rather, the viscanti came into being as victims of the Taint at the time of the Fall of the Celestine Empire. The viscanti were originally members of the other native Lusternian races who were directly caught in the Taint and whose forms became twisted, just as the land became twisted. Through years of interbreeding, they have become recognized as a race unto themselves. 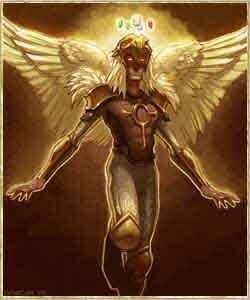 Generally, they are of a demonic appearance though some viscanti retain vestigial characteristics of other races, such as wings of trills (though bat-like and ineffective for flying) or pointed ears of the elfen. The greater viscanti have the ability to breathe poison gas. Although most reside in the Magnagora and neighboring tainted land, a few viscanti have been known to become "reformed" and live in other civilized areas. Level 25: Resistance to poison damage. Level 50: Health and mana regeneration in tainted environments. Viscanti with the Necromancy specialisation gain a bonus to excorable and poison damage. 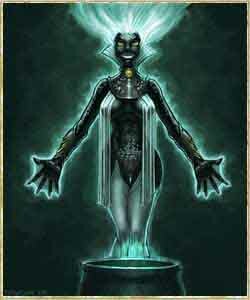 Viscanti with the Geomancy or Geochemantics specialisation gain a bonus to asphyxiation and poison damage. Viscanti with the Necroscream specialisation gain a bonus to excorable and cutting damage. 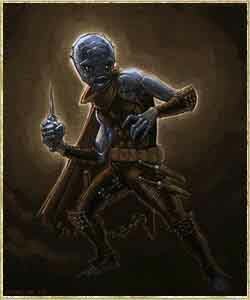 Demigod: Ability: Poison Gas - The viscanti is immune to poison gas. While attacking other players the viscanti has a 5% chance to exhale poison gas at their target, dealing poison damage and afflicting the target with asthma. Demigod+: The viscanti can now exhale a poison gas cloud, dealing poison damag eto all non-viscanti on their ENEMY list and afflicting them with sickness. Poison gas now has a 10% chance to trigger on all attacks against denizens. (Attacks against other players remains at 5%). Viscanti who specialise in the Geomancy, Geochemantics, or Nihilism skills. Viscanti warriors that specialise in the rituals of Necromancy. Viscanti who learn the art of Necroscream.